I'm building the Hobby Boss 1/48 LCM3 for a GB on another forum. I naively thought it would be a mostly OOB build when I started. But, I soon found myself pondering some of the parts, and that's when OOB left the building. As such, I thought this would be interesting to show, here, too. As you can see, I added Eduard's PE for this kit. At first, this all looked OK. Since I would be building this for Overlord, I knew the Sherman wasn't a possibility, but I figured that a Jeep would be a fine accompaniment for the completed kit. My Google-foo soon found an image with the needed detail. Turns out this enlargement showed an LCM aboard an M25, a.k.a., Dragon Wagon. Hm, if only Tamiya would release one of those in 1/48. But, I digress. Here's what I did to fix the kit. Details on LCMs are scant indeed. My best source of info have been videos on YouTube, which showed the next issue. I noticed that when the ramp dropped, there was some activity in that channel at the bow in the photo above. That guide is a C channel with the equalizing sheave shuttling from the aft end of the guide when the ramp is raised--as seen above--to the forward end of the guide when the ramp is lowered. HB was apparently clueless about that, as they just supplied a U channel for the part, with no other connection to the boat beside it being welded to the frames. As for ramp operations, HB guessed there were ramp winches port and starboard, and the cables ran from winch, along the deck to a sheave at the bow, and then up to a sheave at the top of the bow to padeyes on the ramp. Watching more videos and reading the contemporaneous Skill in the Surf: A Landing Boat Manual, led to a better understanding of the mechanism. There's a single ramp winch driven by the port engine, hauling on a cable connected to the eye on equalizing sheave. There's a single ramp cable (wire rope) running from a padeye on the port side of the ramp, over a sheave at the bow, down to a sheave leading into the equalizing sheave guide, around the equalizing sheave, forward to a 2nd sheave at the forward end of the sheave guide, around that sheave and aft above the deck to a sheave that transferred the ramp cable to the starboard side, around a sheave and forward above the deck to a pair of sheaves (bottom and then top) to the other padeye on the starboard side of the ramp. As the name suggests, this arrangement ensures that the tension on both sides of the ramp are equal, ensuring it moves freely. The green line in the image below runs from equalizing sheave to top of the ramp winch cover. The red line shows that port-side ramp cable. The yellow line shows what I believe is the ramp release cable mentioned in Skill in the Surf. I first made up a C channel from 2 strips of Evergreen C channel and strip material. Now that I had the equalizing sheave channel, I needed an equalizing sheave. This is a guess--the only part visible is the uppermost rectangular bar, which is what first caught my attention. With an equalizing sheave guide and equalizing sheave in hand, I turned my attention to the ramp sheaves. Here's HB's interpretation. More searching led me to making these bits. The sheaves are disks cut from 0.01 in sheet punched using Waldron #6 and #4 punches. The rest of the bits are also 0.01 sheet. I used those bits to make these two assemblies. I first thought the winch cover was thinner than HB's part, so I thinned down the port winch cover. Turns out I was incorrect, and HB got the width about right. But the cable entered the winch cover at the top, not the bottom. I was able to refashion the unneeded starboard winch cover into a better shape. HB's winch drum looked more like a sheave. Also shown is the revised winch drum, which I corrected using my smallest square needle file, along with the mounting plate/box for the drum, which I thinned down considerably. Skill in the Surf indicated the LCM carried two 12 foot boat hooks. HB just had some unidentified hooks in the cargo hold. Eduard provided PE replacements for the hooks; they also indicated that plain 1mm rod, 95mm and 60mm long, were to be placed in the hooks. I made up two boat hooks from 0.04 rod, 3 inches long. I tapered the ends and mounted a hook fashioned from 0.026 brass wire into a hole drilled into the tapered end. I'm now working on the 50 cal mounts, shown in the enlargement below. I first noticed that the 50 cal Brownings are not mounted. Harrumph, and I just spent a couple of evenings tarting up the HB Brownings with the Eduard PE and Master barrels. Here's a before and after shot of the HB plastic. The remaining HB plastic, folded Eduard PE, and the marvelous Master barrels. Both HB and Eduard provide an armor plate shaped differently than shown in the photo above. This will be easy enough to fix. The hard bit, where I'm now stuck, is the elevation mechanism. My Google-foo has been unable to find anything like it. If you PM me your email address I have some pics of LCM3/Weapons and bow mechanism that may help . .
Another thing I'm looking at is the routing of the ramp cable athwartship. First, what do those on-deck sheaves look like? I've been scouring the interwebs since I started this project early last month. Here's an enlargement that appears to show the protective plate atop the port sheave. It, like other photos I've seen, also suggests the cable doesn't cross athwartship within the engine compartment, as I had previously thought. Here's another enlargement that might show the cable crossing within the cargo compartment. If it is, is that the cable per se or some protective "conduit"? Also, there's a shadow on the starboard side where the apparent cable would intersect the coaming. I wonder if that shadow is some interior part of the sheave? BTW, this also shows the cable run from the equalizing sheave and the ramp winch, which is at the very right edge of the image. Opinions are welcome! Photos or drawings supporting or contradicting this are most prized! @Arjan, I'm certain the HB kit is a copy of the Trumpeter kit. Thanks for the pix, there are photos I hadn't seen before. The 1st photo in this post of yours(?) show that artifact that is at least consistent with the ramp cable run. One additional bit of information I gleaned from the photo above is the demarcation between the cargo compartment coaming and the deck over the engine compartment. The coaming appears to end right at the forward edge of the engine compartment. That strengthens my supposition about the cable routing. But, I'm still not ready to commit on the ramp cable routing athwartship. I also see what I appears to be the protective plate over that deck sheave; it's more sensibly shaped than another photo I have. That different shape may be some change order that came along or another difference between an LCM built in Higgins v. Boston Navy Yard. FWIW, PA13-2 isn't quite consistent with the photos cited as being from BNY. @longshanks. I saw that review, which found and corrected HB's mistakes that I've tripped up on too. Once you start looking at online photos, you start wondering what Trumpeter/HobbyBoss were thinking. edit: the fourth pic clearly shows the ramp cable inside the cargo compartment. The exact image I needed!!! It clearly shows the cable and some eyes to guide it. I'm also going to declare the deck sheave and protective plates do pierce the coaming. Finally, there are other gems in that picture, such as protective guards around the wing tank manhole covers, a port-side engine compartment vent, the portable bilge pump referred to by Skill in the Surf, additional confirmation of the placement and appearance of light-colored (white?) life preservers. Thanks @longshanks and @Arjan ! You've cleared up my 2 major questions about the 50 cal mounts and the ramp cable arrangement!!! Made progress on the ramp cable in the cargo hold. I first removed HB's misplaced and slightly misshaped engine compartment vent, and built two new vents. HB's is on the left; it's a simple quarter-round. My versions are on the right. They have a quarter-round top part made from a quartered section of 3/16 tube with ends made from a 0.01 disc. The bottom parts are 0.06x0.06 strip. To allow the cable to pass through the cargo hold, I cut 2 slots in the coaming, sized for the deck sheaves to partially sit in the slot. Arjan's photo also shows 2 guide eyes on the engine compartment bulkhead. I fashioned those from 0.01 brass rod. Another photo from Arjan above suggests a triangular protective plate above the deck sheaves. I made those from 0.01 sheet. I replicated the rolled edge using stretched sprue. I fabricated the hull discharges using 1.1, 1.5, and 2mm Albion brass tubing. The manifold around the exhaust is my 2nd attempt. Nice detailing work on this one.. Working on the eyes welded to the frames and deck that guide the various ramp cables. On the port side are the ramp latch release cable, the cable from the ramp winch to the equalizing sheave, and the cable that attaches to the ramp per se. The starboard side only has the cable running forward to the ramp sheaves and then the ramp. An extract of the photo with the best detail on these aspects is shown below. It shows the ramp latch release cable running through holes drilled through the frame. But, looking at my subject reference and other photos show the ramp latch release could also run through eyes attached to every frame. I found another photo that shows these eyes are small and asymmetrically shaped. Back to the photo below, there are 3 eyes for the equalizing sheave cable; two appear to be half -round and the other is rectangular for some reason. The rectangular eye is welded to the rearmost frame, the 2 half-round eyes are welded to every other frame forward of that. Finally, the ramp cable eyes are L-shaped, attaching to the frames at the top and deck at the bottom. The forward-most eye is welded to the foremost frame; the remaining are attached to every other frame running aft. Because of the construction, the equalizing sheave cable eyes and ramp cable eyes aren't on the same frames. HB provided 0.02" copper wire for the eyes. This scales out to 1" thick bars! I replaced that with 0.01" brass wire, which scales out to 0.5" bars. The only smaller wire I have is 0.005", which is very flimsy and feels too small. Anyway, it took about 3 evenings and this morning to put all the above together. Here's my representation of some of the 18 eyes on the port side; there are 7 on the starboard side. I made 5 or 6 more, but they launched into low earth orbit during handling. I'm still working on the guide that routes the ramp latch release cable from the foot-operated control in the conning station. That detail is shown below, in another extract from the photo I showed above. You can also see that the ramp release cable appears to just lay atop the ramp winch cover. I may need to reduce the height of my ramp winch cover. I also haven't worked out exactly what the ramp latch looks like, but I know it doesn't look like what HB provided! HB provides 2 ramp latches that look more like fence latches and were to be attached port and starboard within the hull. I haven't found any evidence of such an arrangement. I made my best guess at the release cable fairlead. I got a little carried away, and the future ramp release cable does indeed pass into the hull. I captured these pix from a USN training film, Amphibious Landing Operations Salvage Boat. Here's a closeup of the helm. HB missed lots of bits. ﻿Got a good shot at a fire extinguisher, which is not red. I've modified the wheel to better match the photo above. Here's my starting point. HB made the outer rim, spokes, and hub all uniform thickness. Here's﻿﻿﻿ my wheel, which has a larger diameter, but the same construction as the LCM wheel above. I expect that the handles are the same size. You'll notice the wheel's rim is thinner than the hub and the bosses into which the handles are mounted. I used my smallest crochet needle file to notch both sides of the rim next to each handle. I then used a new #11 blade to shave away both sides of the rim between the notches. I then cut some "washers" from Evergreen 0.093 tubing, which was a good match for the wheel's hub. I painted the metal parts brass (actually Warhammer "Greedy Gold") and the handles brown (Warhammer "Oak Brown"). Per the prototype, I left the tips of the handles brass colored. I'm pretty happy with this even though the spokes are too thick. A good job of reconstruction . . .
great build thread for a ship which I think is often overlooked. following along and thanks for posting all the great reference pictures. Thanks @longshanks and @s.e.charles! This is indeed an interesting journey. This is a rebuild post. Here's a photo of the control console built per HB's parts and instructions. Clearly, the phrasing indicates problems beyond the wheel that I previously fixed. 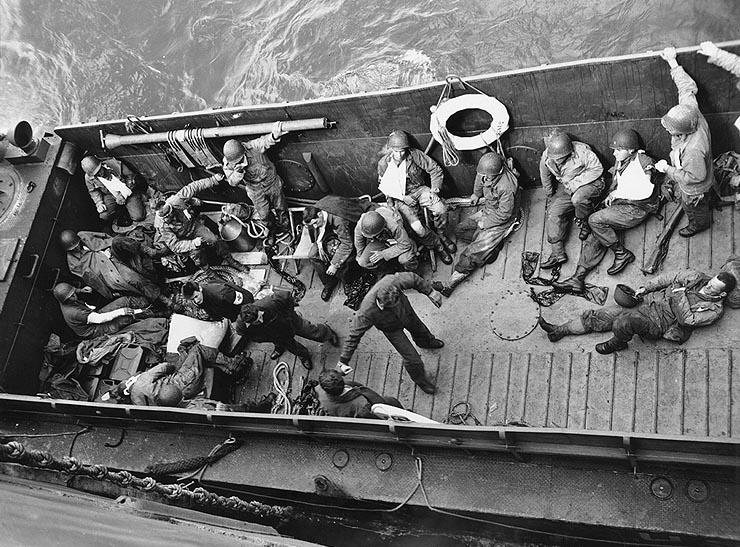 The raised platform is inconsistent with photos of crew standing in and adjacent to the conning station (post 1). Also, the engine control handles are incorrectly ﻿shaped ﻿and the ramp winch control is missing (post 17). After cutting off the raised platform from the deck, I carefully butchered the console so I could rebuild it. The height of the console was increased to match the photos. The engine control handles were made from scratch except for the kit's hand-hold, which I attached with an offset.The ramp clutch was made from bent PE sprue; not quite visible, but it's there. Et voilà, here's my new and improved console. If you look at the photos from the Salvage Boat training film, you'll see the instruments don't occupy the full console top as they do here. I just now--after rebuilding the console--figured out that it's not (only?) because HB made the instruments too large. Most importantly, HB made the console top too small. Dang! I could have fixed that had I noticed it before I rebuilt it. But, I don't think the console will survive a yet another rebuild, so I'll live with this. The Salvage﻿ Boat training film also showed the boat hook. Not﻿ sure what's going on near the end of the boat hook﻿, next to the white hook, perhaps it's unpainted metal? The boat hooks I showed in an earlier post don't look like this. So, I remade my boat hooks. I glued a small Evergreen strip at an angle at the handle end. The strip was then shaped with needle files and a nubbin was formed at the end by dipping the tip in medium thickness CA. I also filled in the gaping hole in the deck where the raised platform used to sit. Making good progress on an interesting subject. I think I figured out the Mark 21-1 mount. I imported a bitmap image of a sectional view of the mount into Inkscape. I was able to trace the drawings to create a vector drawing of the parts I'd make from sheet. I was then able to score some 0.01 Evergreen sheet in my Silhouette Portrait. I tried to cut the sheet in the cutter, but the device isn't strong enough. With the scored sheet, I was able to cut out the parts. I used drills and reamers to cut the holes. Here's an enlarged screen shot of the vector drawing. I have 2 copies of this in the SVG file so I could cut both sets of parts in one pass through the cutter. Various parts are in different layers so I can selectively parts as needed. I also needed various sizes of Evergreen tubing, rod, 0.06 angle, and some Albion tubing. Now to make the other one. At least most of the parts are cut and ready to assemble.